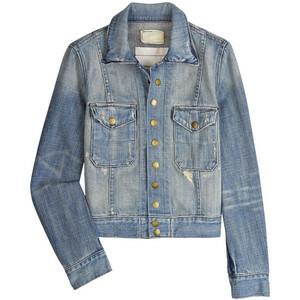 It’s all about denim this fall and well, it’s never too early in the season to invest in the perfect denim jacket. In fact, a denim jacket in the summer can make for the ideal weekend casual brunch look or a comfortable, but chic travel add on. I’m obsessed with the denim jacket I purchased at Blue & Cream this weekend. Earlier in the summer I fell in love with Current Elliott – all their denim is fantastic. Of course I coveted their denim jacket for several months before at long last this weekend finding the exact one that I wanted. I wore it yesterday paired with a long dress from Calypso and a Jerome Dreyfuss Twee. What I love most about the denim is that it can be both dressed up and down. I wore it casually for a late lunch and early dinner, but later in the week I’ll jazz it up and make it work appropriate. I love the dark wash, adorable snap buttons, and the cropped shape makes it easy to wear with longer dresses and skirts. A denim jacket is without a doubt a fashion must, xo.